The Jataka Tales are stories from India telling of the Buddha's previous lives. Some stories tell of the Buddha's previous lives in human form, but many are animal fables, similar to the fables of Aesop. Because the Buddha was not yet a Buddha in his previous lives, in the stories he often is called a "Bodhisattva." This story of the selfless hare appears, with some variations, in both the Pali Canon (as the Sasa Jataka, or Jataka 308) and in the Jatakamala of Arya Sura. In some cultures, the craters of the Moon are seen as forming the image of a face--the familiar Man in the Moon--but in Asia, it is more common to imagine the image of a rabbit or hare. This is the story of why there is a hare in the moon. This forest was a favorite of wandering ascetics--people who withdraw from the world to focus on their spiritual journeys. These acestics lived on food they begged from others. The people of that time considered the giving of alms to the holy wanderers to be a sacred duty. The bodhisattva hare had three friends--a monkey, a jackal, and an otter--who looked to the wise hare as their leader. He taught them the importance of keeping moral laws, observing holy days and giving alms. Whenever a holy day approached, the hare admonished his friends that if someone asked them for food, they were to give freely and generously from the food they had gathered for themselves. Sakra, lord of devas, was watching the four friends from his great palace of marble and light on the peak of Mount Meru, and on one holy day, he decided to test their virtue. Sakra took the form of a Brahman, or priest, and he went to the otter and said" Friend, I am hungry. I need food before I can perform my priestly duties. Can you help me?" And the otter offered the Brahman the seven fish he had gathered for his own meal. Then the Brahman went to the jackal and said "Friend, I am hungry. I need food before I can perform my priestly duties. Can you help me?" And the jackal offered the Brahman the lizard and curdled milk he had planned to have for his own meal. Then the Brahman went to the monkey, and said "Friend, I am hungry. I need food before I can perform my priestly duties. Can you help me?" And the monkey offered the Brahman the juicy mangoes he had looked forward to eating himself. 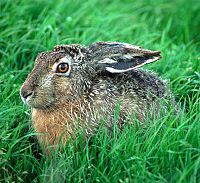 Then the Brahman went to the hare and asked for food, but the hare had no food but the lush grass growing in the forest. So the Bodhisattva told the Brahman to build a fire, and when the fire was burning, he said "I have nothing to give you to eat but myself!" Then, the hare threw himself into the fire. Sakra, still disguised as a Brahman, was astonished and deeply moved. He caused the fire to go instantly cold so that the hare was not burned, and then revealed his true form to the selfless little hare. "Dear hare," he said, "Your virtue will be remembered through the ages." And then Sakra painted the wise hare's likeness on the pale face of the Moon for all to see. Is Bowing a Form of Worship in Buddhism?